Chris and Martin are determined to prove to Aviva that there’s more to crocodiles than their reputation as scary brutes. 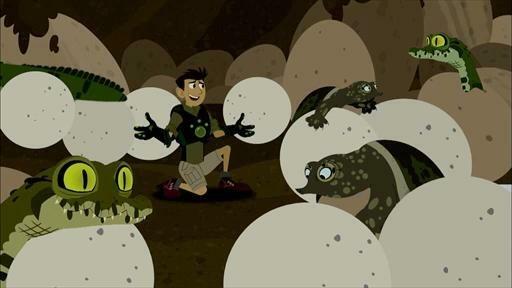 They use an egg disguise, created by the young inventor, to infiltrate a crocodile nest for an insider’s look at the challenging journey of the infant crocs. Learning Goals: The importance of heat in the life cycle of the croc and that heat can even move from one object to another by a process called conduction. Never Before or Rarely Seen Wildlife Moments: A glimpse inside a developing crocodile nest; the maternal care of a mother croc for her babies; an amazing crocodile and hippo encounter. 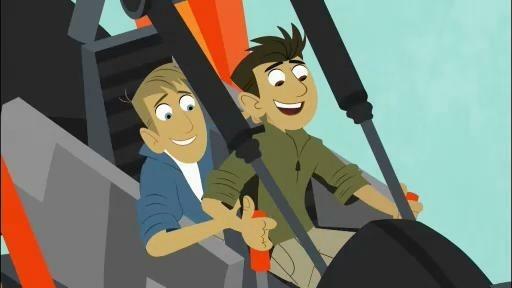 The Kratt brothers are taking Aviva’s submarine prototype out for a test drive when the vehicle gets sucked into a battle between a Sperm whale and Giant squid, spiraling down into the depths. 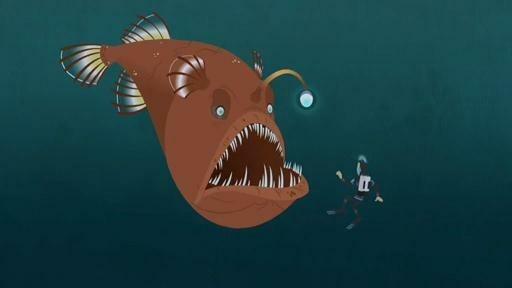 Learning Goals: Experience the force of pressure first hand and join the giant squid and sperm whale in the mysterious depths. Never Before or Rarely Seen Wildlife Moments: Giant squid vs. sperm whale battle. 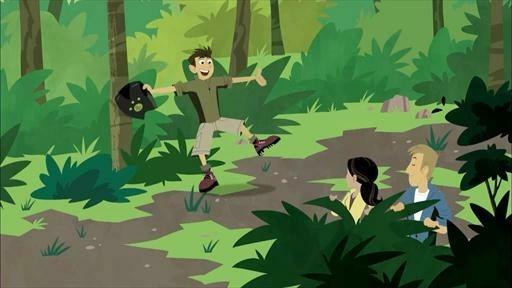 After a young aardvark accidentally becomes a stowaway in Chris’s backpack, the Wild Kratts team sets off on a “door to door” search to return him to his home burrow. 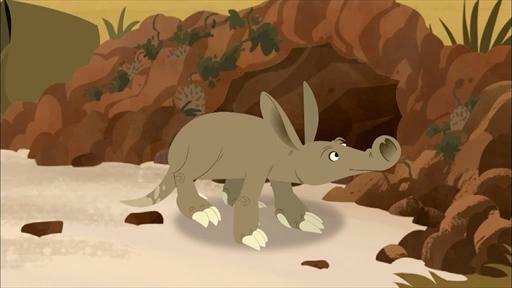 Learning Goals: Discover how aardvarks manipulate earth materials to alter landscapes and learn the incredible (and valuable) service this amazing animal provides to all the burrow-living creatures of Africa. Never Before or Rarely Seen Wildlife Moments: Aardvark raiding a termite mound, and using its powerful digging skills to escape hyenas. While on a mission to discover the secret of the Draco lizard’s gliding abilities, Martin and Chris uncover an evil plot devised by villainous fashion designer, Donita Donata, who has been capturing these amazing creatures to make them part of her new Fall collection. Learning Goals: Learn all about gliding and gravity! Never Before or Rarely Seen Wildlife Moments: Angles and perspective on draco flight; first flight of draco hatchlings. Aviva miniaturizes Chris and Martin for a fascinating underground mission to meet earthworms and “dig up” the answer to the mystery of why worms come above ground when it rains. Learning Goals: Wet objects can be changed by heating and cooling and that the worm’s unique environment helps them stay moist. Never Before or Rarely Seen Wildlife Moments: The underground, private life of the common earthworm. On a kayaking expedition in Australia, the brothers encounter one of the world’s most unusual creatures: a platypus mother with her eggs. 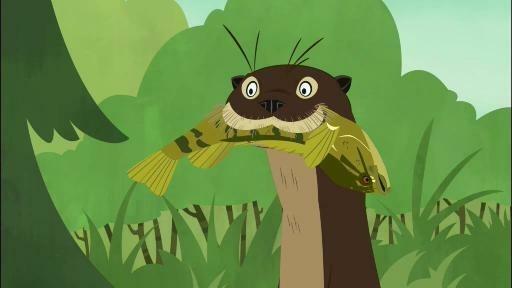 But unscrupulous endangered animal chef, Gourmand, plans on adding the platypus eggs to his menu. Learning Goals: Animals use their senses to find out about their surroundings and themselves, and different senses give different information. Never Before or Rarely Seen Wildlife Moments: Platypus eggs with developing baby platypus inside; mother platypus with eggs inside a platypus burrow; platypus hunting with electroreception. Martin and Chris are on a mission in the Arctic to discover that both buoyancy and traction comes in handy when trying to rescue a Walrus calf and a Polar bear cub from Zach Varmitech. Learning Goals: Learn how animals move around in the Arctic! Never Before or Rarely Seen Wildlife Moments: Walrus and polar bear battle, walrus using pharyngeal throat sacs as built in life preservers to float on stormy seas. 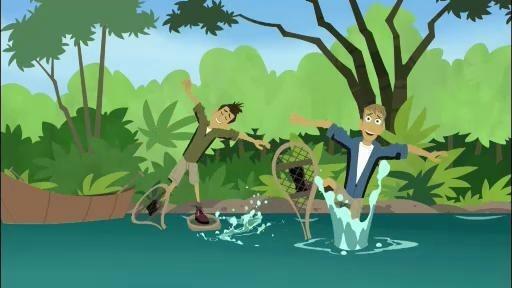 When the Wild Kratts accidentally break a beaver dam, they must help the beaver family rebuild it and restore the pond ecosystem. Learning Goals: Learn how the beavers make marvelous, complicated structures blocking the flow of water down a stream. Never Before or Rarely Seen Wildlife Moments: A family of beavers with kits inside a beaver lodge; the dam building process from start to finish; an otter raiding a beaver lodge. 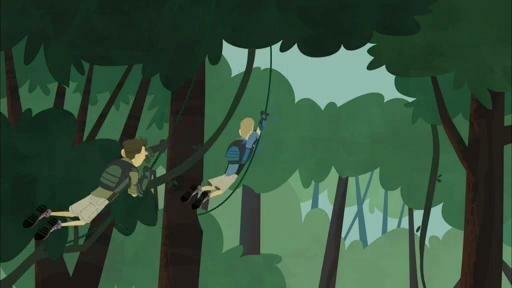 Using Aviva’s newest invention, the Butterflier XT, the miniaturized Kratt Brothers embark on the Monarch butterfly’s 2,000 mile migration to their secret forests in Mexico. Learning Goals: Investigate one of the most unusual animal life cycles on the planet. 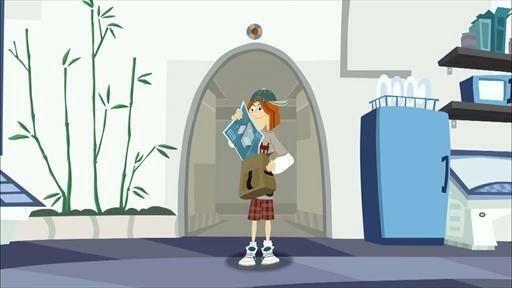 Never Before or Rarely Seen Wildlife Moment: The complete migration from the perspective of a traveling butterfly. 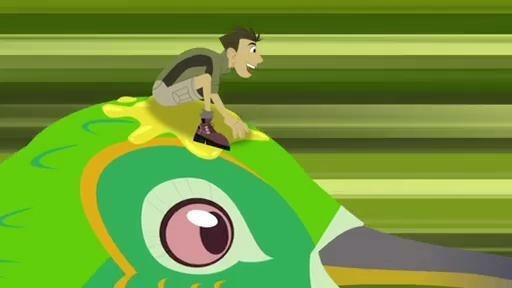 While on an adventure to discover the toughest animal in Africa, Chris and Martin uncover the amazing symbiotic relationships between bees, the Honey guide bird and the Honey badger – a bond that the Wild Kratts team uses to foil the evil plans of Chef Gourmand. Never Before or Rarely Seen Wildlife Moments: Honey guide leading honey badger to bee tree and the two species working together to get honey. 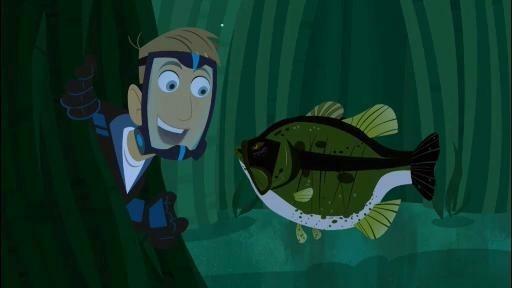 Martin and Chris are in the middle of a friendly competition to find Smallmouth and Largemouth bass when they encounter Gavin, a “Wild Kratts Kid” who is fishing. 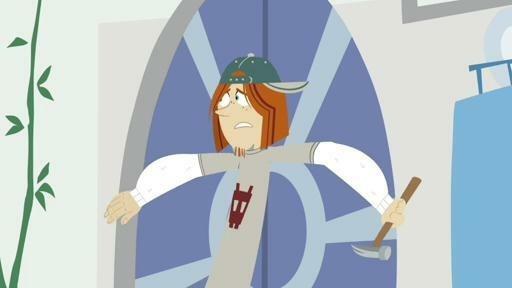 Before they can join him, Zach Varmitech arrives and challenges them all to a fishing contest. Learning Goals: Learn all about bass biology and species diversity. Never Before or Rarely Seen Wildlife Moments: Male bass fiercely protecting young; Sunfish using “wolf pack” strategy to steal bass eggs from the spawning grounds. 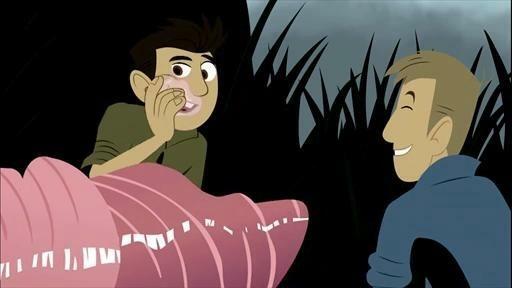 It’s time for the annual Wild Kratts Firefly Picnic so the brothers head off into the forest to find some fireflies to join the fun. But evil fashion designer, Donita Donata, has been capturing all the amazing flashing insects to use for a sparkly, one-of-a-kind dress. Learning Goals: Learn about bioluminescence and fireflies! Never Before or Rarely Seen Wildlife Moments: Close-up view of how the firefly actually mixes up chemicals in its abdomen to create light. Chris and Martin are out to investigate why the walrus looks so weird, but then find out that Zach Varmitech has kidnapped an entire herd to mine precious pearls for Donita Donata’s fashion line. 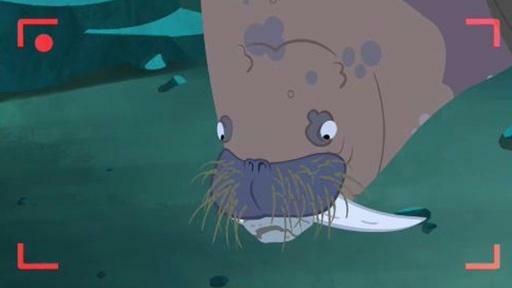 Learning Goals: See how walrus’ employ their super suction and other amazing powers. Never Before or Rarely Seen Wildlife Moments: Walruses using suction to pull clams out of their shells like living vacuums. When Martin and Chris assist the Tasmanian Wildlife Service in tagging endangered Tasmanian devils in order to learn more about them, they discover that Zach Varmitech has begun kidnapping them to create a ferocious new Zachbot. Learning Goals: Discover that a healthy ecosystem contains both predators and scavengers. Never Before or Rarely Seen Wildlife Moments: Young tasmanian devils climbing a tree – a behavior only recently discovered. 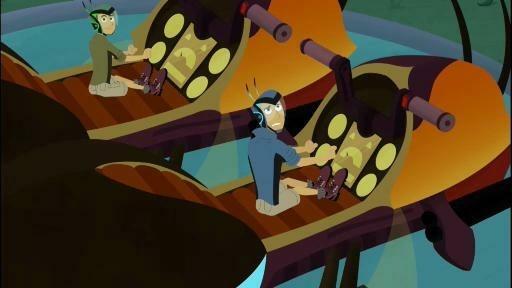 When Martin accidentally knocks the Creature Power Suits into a deep Arctic trench, Aviva takes the brothers to search for them in her brand-new Octopod submarine. 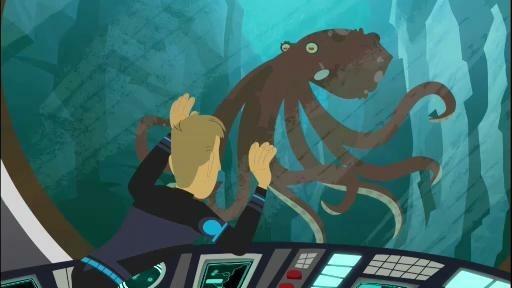 Learning Goals: Learn about all the amazing superpowers that an octopus has for survival, including ink defense, jet propulsion, tentacle regeneration, and camouflage. Never Before or Rarely Seen Wildlife Moments: The giant pacific octopus’ defense tactics in action against a great white shark. When Chris and Martin locate an amazing water-walking Basilisk lizard in Costa Rica, they try to replicate its actions in order to learn how this rare lizard is able to walk on water. Learning Goals: Find out how the basilisk lizard walks on the surface of water! Never Before or Rarely Seen Wildlife Moments: How the Basilisk lizard walks on water. The brothers come across a lone baby elephant and bring him back to the Tortuga HQ for safety until they can find his mom. 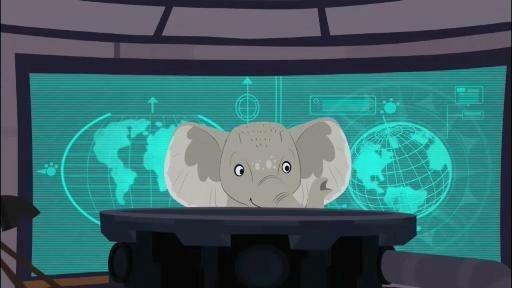 But they learn how mischievous baby elephants can be and get more than they bargained for when it almost destroys the Tortuga! Learning Goals: Animals have different structures that serve various functions in growth and survival. And an elephant’s trunk is like the multipurpose tool of “creature features” with hundreds of uses, including: showering, blasting water, grabbing, lifting, communicating, hearing, pushing and pulling. Never Before or Rarely Seen Wildlife Moment: Elephants ‘hear’ seismic type sounds/non audible rumblings. Episode 118: Let the Rhinos Roll! 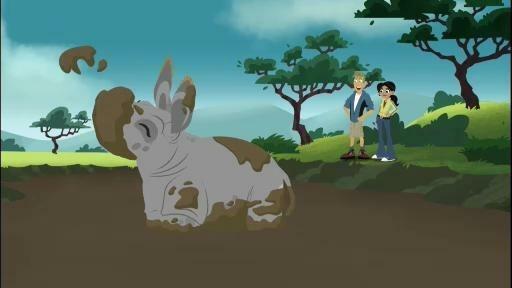 The Wild Kratts team is on an important mission to unearth why Rhinos are mysteriously disappearing from the African Savannah. 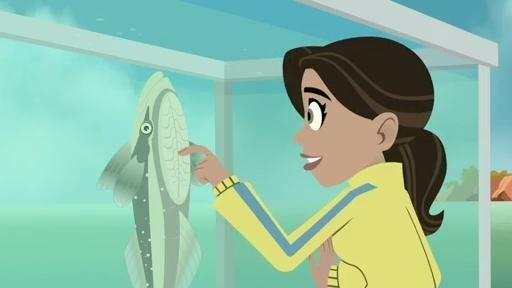 Learning Goals: Explore the nature of symbiotic relationships and learn that animals have different structures and behaviors that help them defend themselves. Rhinos use their size, sharp horn, mud bathing and their relationship with a small bird for defense. Never Before or Rarely Seen Wildlife Moments: The symbiotic relationship of the oxpecker and rhino, rhino mother protecting rhino calf from a herd of lions. 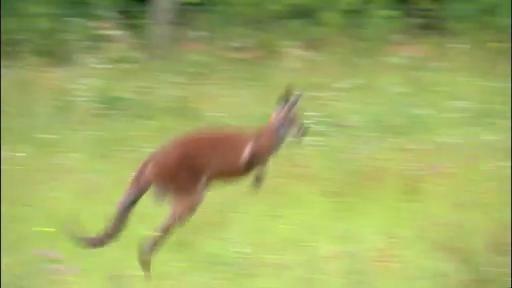 When Chris and Martin meet up with a mob of Red kangaroos, they get their car keys stolen by a joey and have to figure out how to get them back from the tricky little guy. Learning Goals: Animals live in different kinds of social groups and they have important behaviors that keep the group together and safe. Never Before or Rarely Seen Wildlife Moments: A Red kangaroo holding a dingo underwater as a defense. 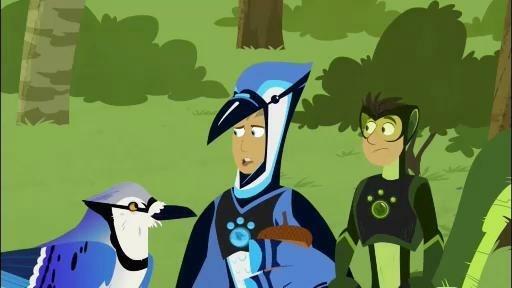 Martin and Chris are absorbed in a hilarious competition to discover who is the best acorn planter, blue jays or gray squirrels, when a strange Creature Power Suit malfunction transforms Martin into an acorn and grows him into an Oak tree! Learning Goals: See the many relationships that the oak tree has. Never Before or Rarely Seen Wildlife Moments: Blue jay and gray squirrel competing over acorns, deer and coyotes eating acorns. 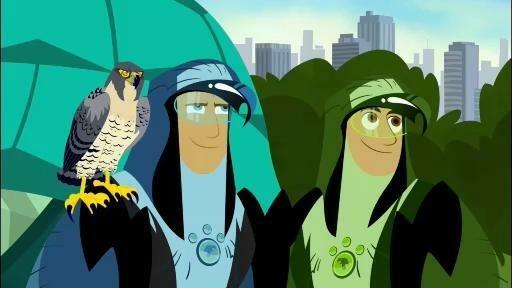 The Kratt brothers are itching to fly with the world’s fastest animal, the Peregrine falcon, which can hit top speeds of 240 mph. Learning Goals: See how the peregrine falcon harnesses the power of gravity to reach high speeds. Never Before or Rarely Seen Wildlife Moments: Nestling pigeons drinking “pigeon milk” from both parents, step by step of peregrine falcon harnessing the force of gravity to be the world’s fastest flier. 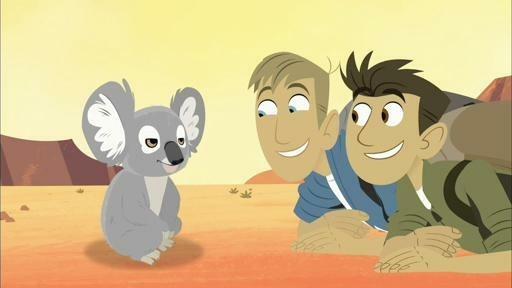 Martin and Chris must protect a young koala stranded in the Australian Outback, and help him get back to his Eucalyptus forest habitat. Learning Goals: Find out how animals have specialized diets for their environment. Never Before or Rarely Seen Wildlife Moments: A pack of dingoes chasing a koala, the thorny devil’s special straw like skin features that bring dew to his mouth through capillary action for the desert lizard to drink. 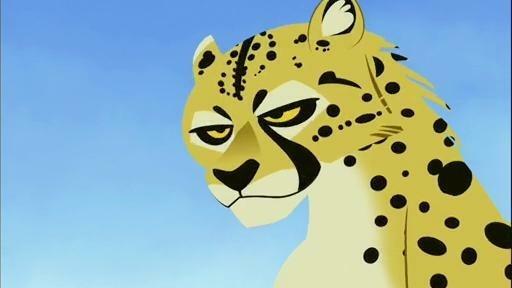 Chris and Martin announce that no creature or vehicle can travel as fast over the rough and tumble African savannah as the cheetah. Aviva takes the challenge and declares she will build a ground racer that can run even faster than a cheetah. Learning Goals: Find out what makes a cheetah run so fast! Never Before or Rarely Seen Wildlife Moments: New look at the cheetah’ unique body design and the aspects that make it the fastest animal on the planet. 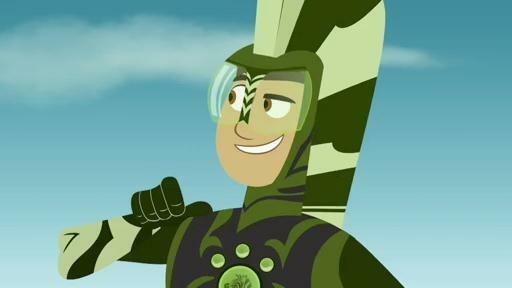 When Martin’s and Chris’ Creature Power Suits unexpectedly get jammed in Proboscis monkey mode and the top monkey of the troop is injured protecting a youngster from a crocodile, the Kratt brothers find themselves stepping into the injured monkey’s role. Learning Goals: Uncover some of the different methods animals utilize to communicate important information to each other. Never Before or Rarely Seen Wildlife Moments: Proboscis monkeys swimming in a river; clouded leopard and gavials (crocodilians) hunting proboscis monkeys; proboscis monkey using their honking alarm call as a predator alert. While exploring why some animals mimic the looks of others, Martin and Chris encounter a cheetah cub and its mom. But before they know it, evil fashion designer, Donita Donata, ‘cat-naps’ the startled mom right in front of their eyes. Learning Goals: Discover that the cheetah cub has unexpected powers of mimicry, and it’s ability to mimic the ferocious honey badger – is the key to foiling Donita and protecting the cheetah. Never Before or Rarely Seen Wildlife Moments: Cheetah cub mimicking a honey badger and discouraging predators from coming too close. 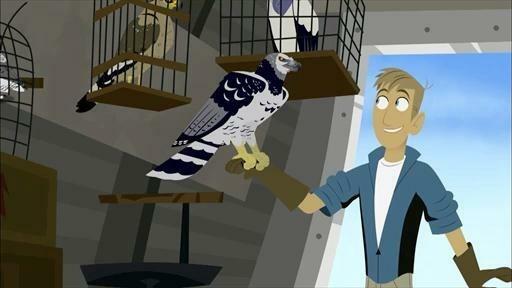 The Wild Kratts crew is are playing badminton on the African savannah when a high jumping wildcat called a caracal steals the birdie. And this is no ordinary birdie – it is Aviva’s precious family heirloom. Never Before or Rarely Seen Wildlife Moments: The caracals ability to catch multiple birds in a single leap; inside a caracal den with kittens. Chris and Martin get caught in the middle of a Zebra stampede, and when the dust clears, a lone baby Zebra is left behind. 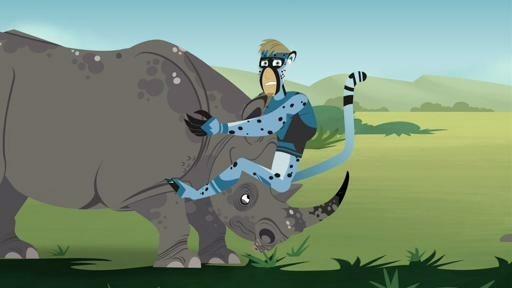 The Wild Kratts must find the young zebra’s herd and return him to his mom. Never Before or Rarely Seen Wildlife Moments: Zebras using their unique “confusion camouflage” defense against predators; a stallion face-off. While Chris and Martin are off searching for the endangered Orangutan in the deep forests of Borneo, back at the Tortuga HQ Aviva, Koki and Jimmy get carried away swinging on vines and their muscles so get incredibly sore that they can’t move a muscle. 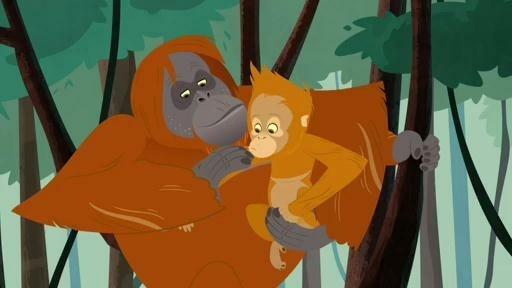 Learning Goals: Orangutan’s create their own healing lotion to cure aches and pains. Never Before or Rarely Seen Wildlife Moments: Orangutans making medicine out of leaves to relieve itching; newly-discovered behavior of orangutans mashing collellum leaves as a poultice to relieve muscle inflammation and soreness. 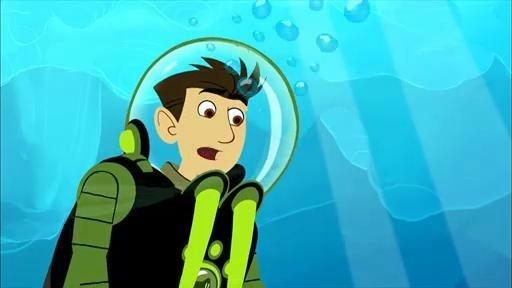 The Kratt brothers’ sub loses power while they are exploring the strange landscape of the ocean depths and they are trapped on the ocean floor of the deep sea. Learning Goals: Learn all about the amazing process of chemosynthesis and how deep sea creatures transform toxic chemicals into energy. Aviva wants to build a food web for the African savannah, so she devises a game and Martin and Chris accept her challenge! Learning Goals: Boost your knowledge of the complex relationships between predators and prey as well as the differences between herbivores and carnivores. Animals Featured: Too many to name! Never Before or Rarely Seen Wildlife Moments: Termites collecting and eating grass; bat-eared fox escaping marshall eagle. 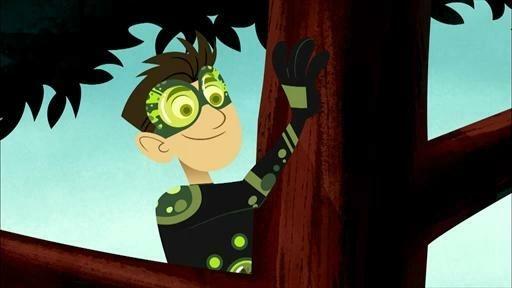 As they prepare for a creature costume party, the Wild Kratts team begins to notice all sorts of strange things happening in the Tortuga HQ. Learning Goals: Certain animals gravitate towards human habitation because it provides food and protection from predators. Never Before or Rarely Seen Wildlife Moments: Raccoon swimming, wolves hunting raccoon. When a miniaturized Chris gets covered with pollen and ends up sticking to a bee, he’s off into the remarkable world of the pollinators. Learning Goals: Plants use animals to help them make their seeds through a process called pollination. Never Before or Rarely Seen Wildlife Moments: Up-close views of pollinators pollinating flowers and even actual pollen grains; a crab spider attacking a bee. 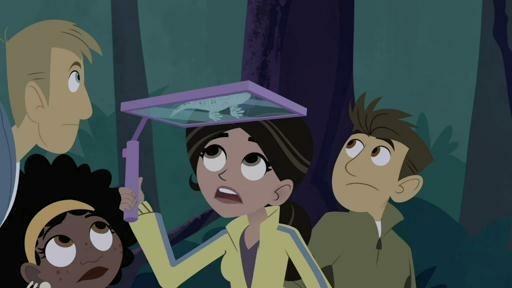 There’s a mystery to be solved, as the Wild Kratts team wonders how a Gecko lizard climbs up smooth surfaces and can even climb upside down. Learning Goals: Find out how the gecko climbs upside down even on smooth surfaces. Never Before or Rarely Seen Wildlife Moments: The geckos footpad in close up and in action climbing surfaces as smooth as glass; close-up of a gecko’s bizarrely shaped pupil, which enables the creature to see in full color even in low moonlight. 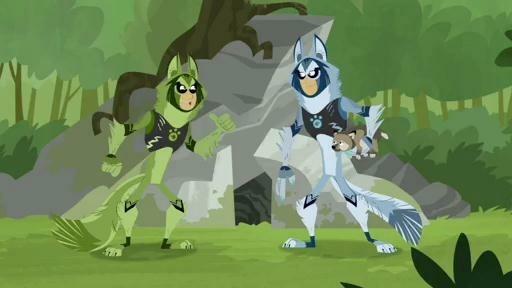 Chris and Martin are unpacking from an adventure and are surprised when a Wolf pup pops out of their bags. They have no idea where the little guy came from and must retrace their steps in order to return him back to his pack. Learning Goals: Learn about the socialization of wolf packs. It’s Aviva’s birthday, and Chris and Martin decide to collect shed porcupine quills to make a beautiful necklace as a gift. 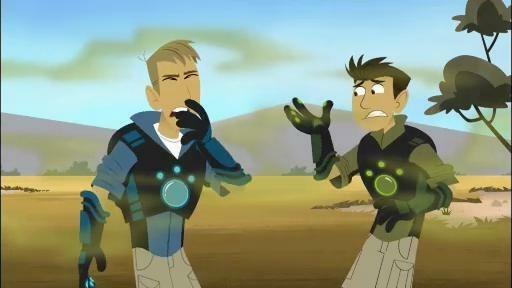 The Kratt brothers must use this amazing defense to protect the porcupines from Zach’s latest animal collection scheme. 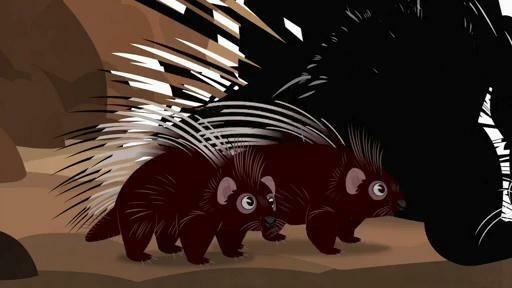 Learning Goals: Find out how the porcupine uses their specialized defence. Never Before or Rarely Seen Wildlife Moments: An african crested porcupine defending itself from a lioness. 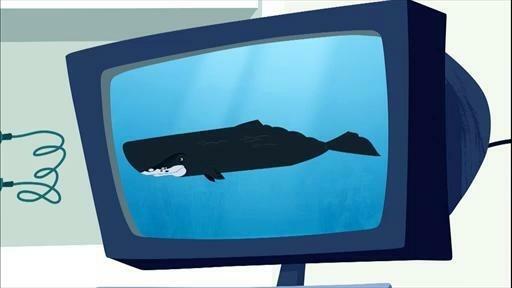 Martin and Chris are on a mission to uncover the secret life of the mysterious Great White Shark while Gourmand sniffs around looking for ingredients for his Shark Fin Soup recipe. Never Before or Rarely Seen Wildlife Moments: Orca attacking a great white shark; great white at a “cleaning station”. When Aviva reveals that dancing is just not her thing, Chris and Martin set out in the New Guinea forest to inspire her to give dancing a try by uncovering some of the greatest dancers in the creature world – the Birds of Paradise. Learning Goals: Male Bird of Paradise uses his showy bright feathers and extraordinary dances to display to potential female mates that they are healthy and strong. 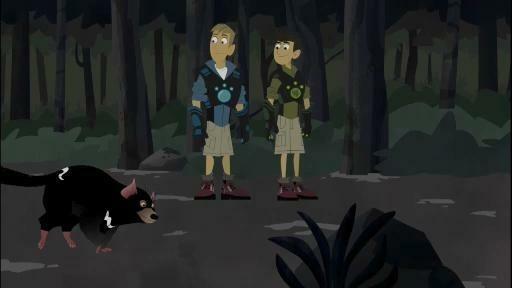 The Kratt brothers secretly “borrow” Aviva’s half finished night vision goggles to go in search of a mysterious nocturnal creature. Martin and Chris challenge themselves to ID as many hawks, eagles, owls, falcons and vultures as they can. 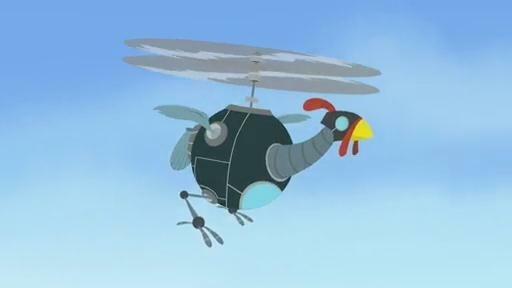 But the evil endangered species chef, Gaston Gourmand has his own plan for the raptors and has been capturing them all in his quest to find the tastiest bird wing. Learning Goals: Learn about classification and birds of prey. Never Before or Rarely Seen Wildlife Moments: A secretary bird hunting the venomous black mamba snake. 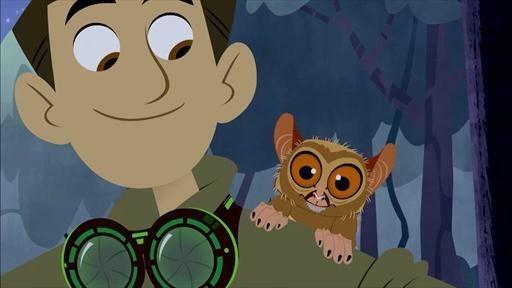 When a little brown bat crashlands into a plate of Jimmy Z’s famous brownies, Martin and Chris out set out to convince Aviva, Jimmy Z and Koki that bats are nothing to be afraid of. Learning Goals: Learn about bat ecology, predators and insects and echolocation, and learn to love bats. Never Before or Rarely Seen Wildlife Moments: Little brown bats catching mosquitoes in flight; a screech owl chasing a bat.